Review posted August 12, 2016. Candlewick Press, 2015. 40 pages. Here’s a book that makes me smile. It’s simple, matter-of-fact, and utterly charming. I wonder where my little bear is. I wonder where my big bunny is. You see, the bear is sure the bunny is a very small bear. The bunny is sure the bear is a very large bunny. This is not so, but it would be too hard to explain it to them. Besides, it doesn’t matter. 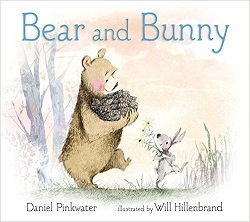 Kids will enjoy understanding things better than Bear and Bunny do. Adult readers will enjoy singing the simple songs. This is a friendly, cozy book about the wonder of living in an interesting place – even if you don’t fully understand everything you find.